A 5-foot-wide replica of a fossilized protostega, a Cretaceous-era sea turtle, swims away from a 45-foot-long replica of a fossilized mosasaur in the atrium of the new Earth, Energy and Environment Center at the University of Kansas, Thursday, Nov. 30, 2017. Eighty million years ago, giant marine monsters called mosasaurs ruled the land now known as Kansas. The Cretaceous-period reptiles are long gone these days, as is the vast inland sea that turned into prairie long ago. 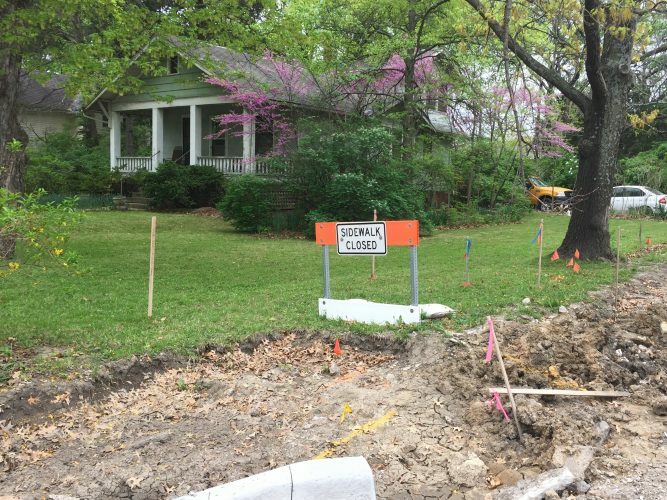 But the mosasaur lives on at the University of Kansas. 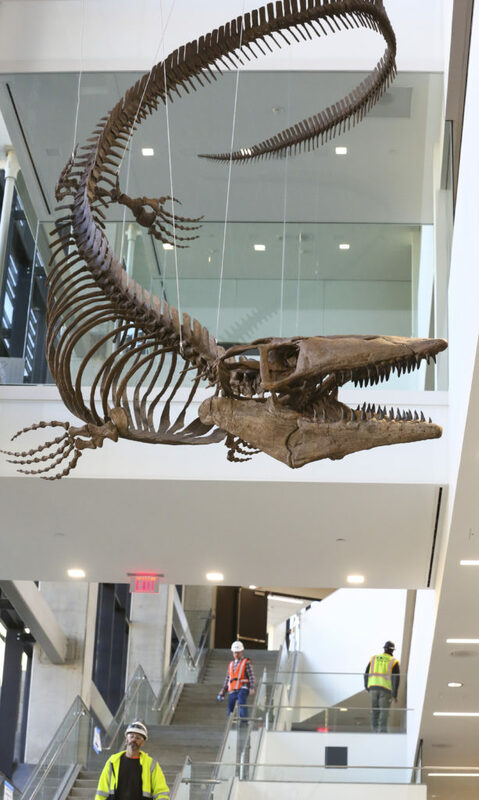 In a nod to the Sunflower State’s geological history, crews on Wednesday installed replicas of two fossilized skeletons — one a mosasaur, the other a giant Cretaceous-era sea turtle — in the atrium of KU’s new Earth, Energy and Environment Center. 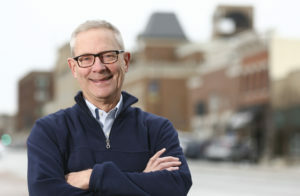 “We wanted to do something that was ‘Kansas,’ and so this is really the perfect fit,” said Robert Goldstein, a Haas Distinguished Professor and associate dean for natural sciences and mathematics in KU’s geology department. 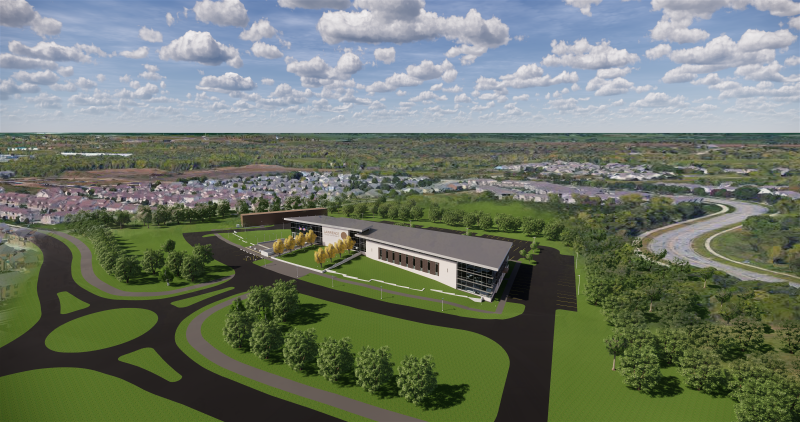 The $78.5 million building, at the corner of 15th Street and Naismith Drive, opens in January as the new home of KU’s geology department and portions of the chemical and petroleum engineering department. Its sunlit atrium in the building’s southwest corner houses a larger-than-life recreation of a scene that may have played out 80 million years ago not far from the KU campus. 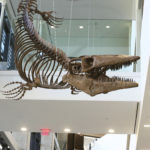 A 45-foot-long replica of a fossilized mosasaur skeleton is suspended from the ceiling of the main atrium in the new Earth, Energy and Environment Center at the University of Kansas on Thursday, Nov. 30, 2017. 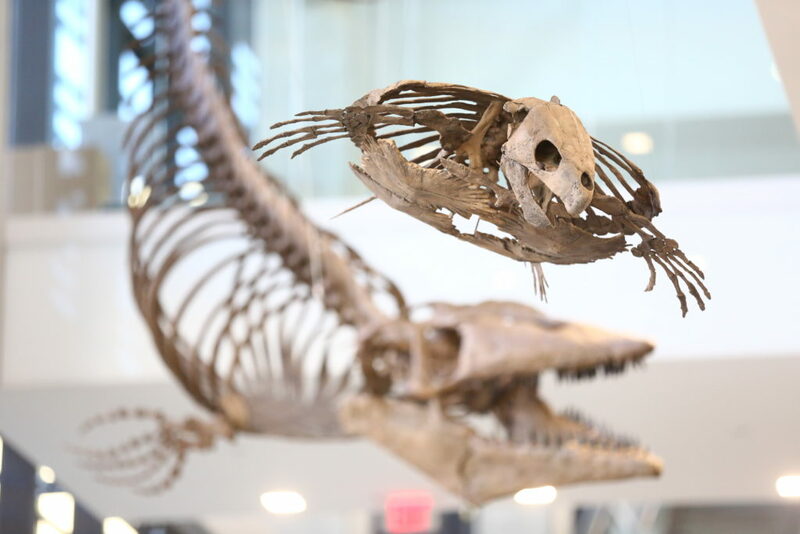 Hanging from the ceiling are fossil casts of the mosasaur diving headfirst toward the protostega, an early ancestor of modern Hawksbill or green sea turtles. 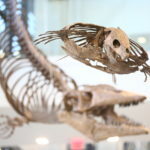 Both skeletons were found in Kansas — the mosasaur in Logan County in 1911, the protostega recovered near Quinter in 2011. If the 45-foot-long mosasaur cast looks familiar, that’s because the original fossil, first discovered by C.D. 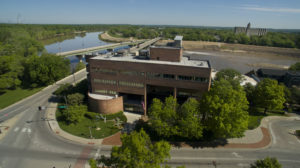 Bunker and his associates from KU, has long been displayed at the KU Natural History Museum, where Bunker worked as an assistant curator. The turtle, collected by KU alumnus and Triebold Paleontology curator Anthony Maltese, has a flipper span measuring about 5 feet and a shell littered with nearly 100 unhealed bite marks. Goldstein and his colleagues theorize the protostega likely suffered a lethal attack from a mosasaur the size of Bunker’s. They also think EEEC’s new fossil cast, built by the Colorado-based Triebold Paleontology, might be the largest complete mosasaur specimen of its kind. 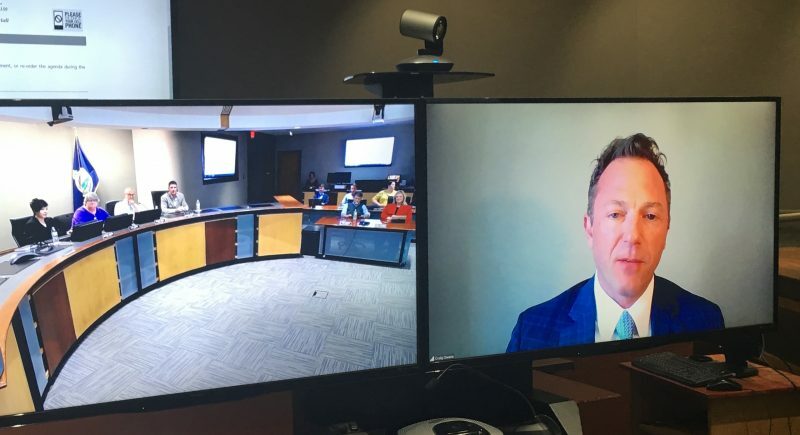 It’s also the official state fossil of Kansas, fitting nicely, Goldstein said, with the overall theme of KU’s new Earth, Energy and Environment Center.